Apple’s App Store for the iPhone and the iPod Touch has today broken three billion downloads, with estimates putting the service at almost 120 downloads per second. Microsoft has started rolling out the beta version of its upcoming office suite, Microsoft Office 2010 to members of its Microsoft Developer Network (MSDN) and Technet developer groups. Microsoft has also launched its Office 2010 beta homepage for anyone looking to get in on the public beta testing of Office 2010. For the moment, the page just says that the public beta will be opening soon and, while it doesn’t offer any more detail than that, we’re told to expect it to open properly over the course of the next week or so. The idea of having a public beta has always been a nice way for any students out there to get their hands on some software to take notes with, without having to actually shell out any cash for it… without having to go the OpenOffice.org route, which many users still shy away from, despite it being free. 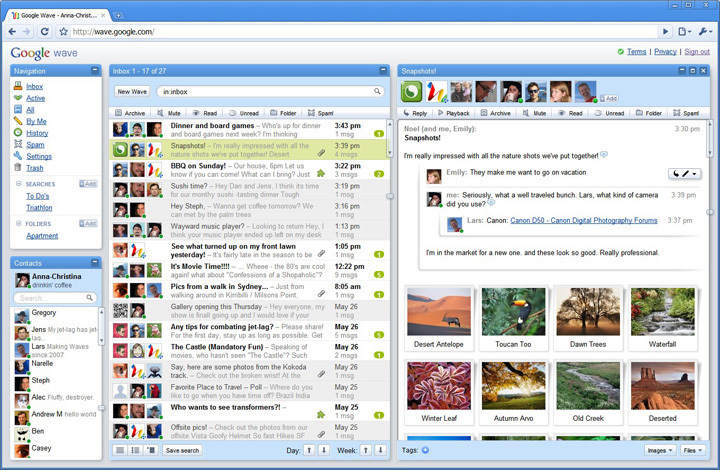 Google Wave Interface to Hit Other Apps? Reports indicate that Google is looking to add some of the cleanness and depth of its Google Wave interface to its other web-based applications. For those who haven’t yet used Google Wave or seen how it looks, the above is a screenshot of the default view of Google Wave (click through to see it a bit bigger). While the fact that the inbox is broken up so that the contacts list, inbox and the wave(s) you’re currently reading is the biggest difference between Wave and Gmail, the second most noticeable shift has to be the fact that the interface is so elegantly executed. It looks as though Microsoft’s upcoming Office 2010 is really starting to come together, with the web-based version of some applications already being trialed by test users. Word comes via the Microsoft Office Web Apps blog that it has started making web-based Excel, Word and Powerpoint available to a select group of users for testing. Apparently they’re admitting that the initial functionality will be “modest” but they’re hoping to have it expanded over time until it constitutes a more robust service. Microsoft has released some more details about the upcoming update to its Office suite in the form of Microsoft Office 2010. The packages much touted web-based versions of certain applications won’t be available to users of three of the top five browsers at the moment, Google Chrome, Apple’s and Opera. While we’re all in favour of the idea of a Microsoft Office web solution, it coming at the cost of being able to use your browser of choice seems to run counter to the whole spirit of web based apps altogether. While, it’s nice to see that Firefox is supported, the decision not to support the Windows version of Safari 4, while supporting the Mac version, seems decidedly strange. Chrome OS to Replace Android? Rumours are starting to surface that Google’s upcoming Linux based Chrome OS may end up running on significantly more than just netbooks. Naturally, the assumption had been that Chrome OS would start with netbooks and move up from there, but it’s looking more and more like Chrome OS might well end up on smartphones too. Google’s Vic Guntorda stated at Mobilebeat 2009 that web apps are very much the future. The only problem with a statement like that is that Android, as it is now, seems to be the most native app friendly of Google’s two platforms. This is interesting if only becaise, in Chrome OS, Google already has a platform rumoured to run web apps exclusively . As Gizmodo points out, the interesting part of all this is that Guntorda isn’t really part of the Android team, yet it sounds very much as though (in a speech effectively about mobile platforms) he’s touting Chrome OS as Google’s future smartphone OS.